I have sent in opposition to the bill to protect public’s right to control placement of small cell radiation sites. I recently received a City of Richmond Planning Commission notice about a hearing on an application to install these within sight of my home. 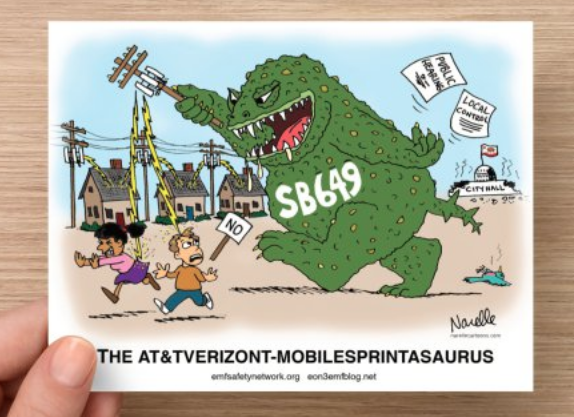 At the hearing I was told it was a 4G/broadband system for the benefit of T-Mobile to be deployed one section of town at a time, beginning in the Iron Triangle, a poor area where many people would not even read the English language notice. One Commissioner expressed concern about the precedent of not understanding potential health issues. But it was my understanding that their legal guy said the only things they could take into consideration were aesthetics and the City’s General Plan. “Our hands are tied.” This is even before SB 649. Richmond has an ordinance that had already been watered down by federal regulations. The city opposed 649 but the City Planner told me today they expect it to pass and lose their oversight. Thanks for your work to alert us and our legislators to the dangers of this technology and this blank to blanket our neighborhoods with it. They changed the bill text by removing specific language like parks, campus’s hospitals to now just say “on vertical infrastructure” and “other suitable host infrastructure” both within and outside the public right-of-way. It doesn’t exclude buildings. It’s deadly, destroys the nervous system of. Human beings!!! !stop the ensanity of this technology!